The post-February euphoria in the US bond market has been a sight to behold, stirred up by NIRP and QE in Japan and the Eurozone. The ECB is beginning to buy corporate bonds, including euro-denominated corporate bonds issued by US companies. This is pushing larger amounts of corporate euro bonds into the negative-yield absurdity. And it has opened all kinds of credit doors in the US. But beneath the market euphoria, reality continues to plod forward. Standard & Poor’s reported that among the companies it rates there were 12 defaults in May, which pushed its speculative-grade corporate default rate up to 4.1%, the highest since December 2010 when it was recovering from the Financial Crisis. In January, so just five months ago, the default rate was still 2.8%. That’s how fast credit is deteriorating. Even during the early phase of the Financial Crisis, in September 2008, when Lehman Brothers filed for bankruptcy, and when all heck was breaking lose, the default rate was “only” 2.96%, before skyrocketing and eventually peaking at 12% in November 2009. These are the largest US corporations, rated by Standard & Poor’s. But about 99% of the 19 million or so businesses in the US are small, generating less than $10 million a year in revenues, according to Dun & Bradstreet. None of them are rated by Standard & Poor’s, and none of them figure into its default rate. Another 0.96% or 182,578 businesses are medium-size with sales between $10 million and $1 billion. Only a smallish portion of them are rated by Standard & Poor’s, and only those figure into its default rate. The rest, the vast majority, are flying under Standard & Poor’s radar. And how are they doing? Here’s a clue: Total US commercial bankruptcy filings in May soared 32% from a year ago, to 3,358, the American Bankruptcy Institute (in partnership with Epiq Systems) just reported. It was the seventh month in a row of year-over-year increases in commercial filings. Chapter 11 filings (when a company “restructures” its debt, often wiping out stockholders and unsecured creditors, but continues to operate in the hope of emerging from bankruptcy with a more manageable load of debt) jumped 22% from a year ago, to 611. Chapter 7 filings (when a company gives up its ghost and “liquidates” by selling its remaining assets and distributing the proceeds to creditors) soared 32% from a year ago, to 1,938. Bankruptcy filings, like so many things, are highly seasonal. Monthly numbers depend on the number of filing days in that month, tax considerations, and so on. These are raw, unvarnished numbers. They’re not adjusted for seasonality or whatever. They’re volatile from month to month. But they do show the trend! The chart puts a date on when the last credit cycle, that had started after the Fed kicked off the bailouts and QE in 2009, ended: September 2015. Then suddenly, bankruptcies began to soar. Other data place that point-estimate into different months, but they all agree that it was sometime in 2015, when credit contagion spread from energy to other sectors. 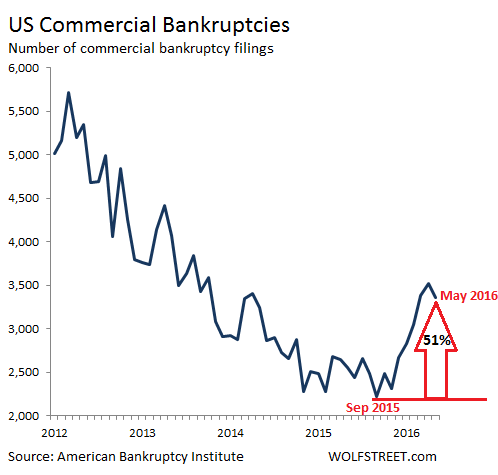 Commercial bankruptcies will continue to zigzag higher. This is among the consequences of seven years of desperately easy money: too much debt has piled up, and now companies are having trouble dealing with it while they’re struggling in an economy that is a heck of a lot tougher than the rosy scenarios projected year after year by economists on Wall Street, in government, and at the Fed. I suppose you could term Amazon “creative destruction.” Or maybe it’s just accomplishing in big cities what Walmart accomplished out in the boondocks. The frackers were caught in the open when Saudi Arabia commenced firing. You may add these commercial bankruptcies to the ever growing litany of “bad” news, that are part of the global economic “fundamentals”. Also as of yesterday, U.S. stock mutual funds posted $4.7 billion outflows, the 12th straight week of cash withdrawals. And for the ‘cherry-on-top’ the global sovereign bond market has now topped over $10 trillion of bonds trading with a negative yield. With the worst employment report in the past 6 years out this morning. The ongoing “bad” news just keeps pilling up. The majority of German’s use cash to settle accounts and pay for purchases, rather than using credit or debit cards. It is now Friday evening in Germany, the busiest time of the week for cash withdrawals from ATM’s. Except, the ATM’s at Deutsche Bank are down. No cash to be had. Official reason? Technical glitch. Or… ? One of the good things about the bankruptcy process is that it wipes the debt off the official books of all parties and makes them account for the losses. This is the process that has been avoided in the general economy and haunts it. The irony of bankruptcy is that it costs money to go bankrupt, so the option is unavailable to the people that need it most. I know a couple of people that have done what is here called ‘consumer debt option’ and a lot of advisers have sprung up, when you really don’t need one. Basically you tell your lender(s)- unless you reduce my balance to X and rate to Y I will go bankrupt. One gal (who BTW went bankrupt before about ten years ago- but got a mortgage 5 years ago) just went this route reducing 80K to 35 K. Don’t know details of rate etc. A key part of the process is establishing an account out of reach of creditors- where yr check goes. Here in BC, Canada there are free govt advisers about this. It annoys the bankruptcy trustees ( CPA’s etc) but they are for the big guys not us squirrels. The dominos are starting to fall or have been since last year and now the momentum is growing. When these companies have to start liquidating their positions to cover other position or losses then deflation will really be in full gear. With 10 trillion of sovereign debt trading at negative yield it will become real interesting when they start getting no bids. Only In stupid country’s like America. In sensible country’s, the Bankrupt simply walks into the courthouse with two forms of ID. Fills out the form. The judge then assign’s a liquidator after reviewing the form and sometimes asking a few Question’s. Worst way to do it. as generally you get a state liquidator who is not very friendly. however cost to the bankrupt for the whole process $0.00. Down side, after the liquidator has finished you will spend up to 7 years having your finances supervised by a State appointed Assignee. Cost of that still $0.00, but they will make you contribute to your old creditors in that 7 years if you have, or get, a reasonable income. Whats your best advice for the small investor that has individual stocks and mutual funds? Should I sell or ride it out. Rode out the last big mess and not sure at all what to do this time. Stay in good stocks because if the bond bubble bursts which I think is very much on the cards big money will have to park it somewhere and if they panic out of the bond markets capital will flee Europe and head into the USA stock market. It is the only market deep enough to absorb that amount that needs to be parked. Gold and silver coin sales are up over 100% from May of 2015 with gold coin sales up 206% year-over-year and silver coin sales up 122% from May last year. Thanks Jerry. Yes this is how I feel too. Long term I’m bullish on America. I’m always bullish on America. I believe we can always figure out how to make something work, even if it’s hard and messy getting there. There are a lot of things I disagree with, but I’m just one voice in about 340 million. I’m not always bullish on stocks and bonds. Right now I’m as un-bullish about them as I can get…. Worst employment report in over 6 years. American’s not in the labor force is now at a new record high of almost 95 million people. Labor force participation rate is now back at 1978 levels. Yet, the unemployment rate fell??? WTF? Quote: Feds Kaplan; “We are at or near full employment”. The Feds have totally lost the plot. My wife, I and my grandchildren are not in the labor market, because my wife and I are over 70 and my three grandchildren are under 16 year of age. None of us are looking for a job. Typically “working-age persons” is defined as people between the ages of 16-64. People in those age groups who are not counted as participating in the labor force are typically students, homemakers, non-civilians, institutionalized people, and persons under the age of 64 who are retired. Teachers fleeing the public education “system”, front lines of the Decline of Western Civilization. Some of them are boomers, of course. Would you want to be teaching in American public schools? 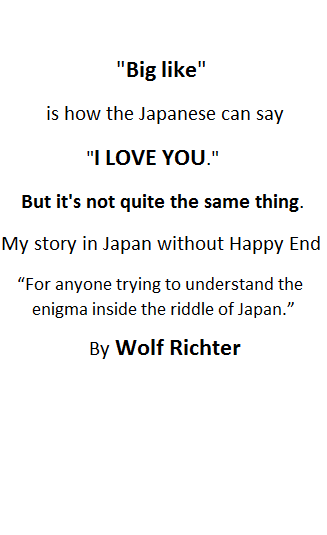 Thanks Wolf. As a small investor Ive always subscribed to the buy and hold method since guys down on my level simply don’t get the information in time to make trades like some of the upper level insiders. Its served me pretty well until now but Im getting nervous. So do you think I should try market timing for once and sell? Ive always been against this since as above Im not certain I could hit the right time to buy back in before missing the rally back up. Also since Im just a regular joe stock buyer, mutual fund trades take almost a day to accomplish. They buy the funds at the close price. I really would value your views on this. Of course I understand you can’t guarantee anything and are not my financial advisor. Just wanted to get your read. I don’t want to get wiped out. Im mid 50’s and have some time to recover before retirement. Although the employment market has left me in the lurch. Very small amount of people knows what is happening worldwide in financial sectors. Very very hard to know the truth. Every sectors are on artificial respirators. That will not last long. All financial sectors are due to collapse in a short time. Something bigger that in your worse nightmare. Go out of the stock, US bonds are safe investment, put more and more money in your mattress, do not borrow money. Oil will go down to around 10 to 15$. Gold around 150$ Oz. Silver 3to4$. Remember Greece, one morning all banks were bankrupt and doors lock up. No more money plastic or paper. The winners; someone with stuffed mattress. PAY OFF ALL YOUR DEBTS, especially your home. Pay down your home FIRST, so you have a place to live. Credit cards should be the last you pay off since if you default there is really nothing they can do. Have one good car paid off since transportation is important. I would also begin working 2 jobs now. I am self employed with my own business and I work 6 days a week. I do the paper work of an additional employee but won’t hire anybody due to the costs, the headaches, the Obamacare bs, the paper work. I prefer to work 3 nights a week and Saturdays doing this “paper work” than hire another. Thank you Government Regulations. Hring anybody in America is one hellish move. I work my business with the fewest employees, who think like I do, want to make money and don’t care about the bs government rules. Then, any “excess” money, buy silver coins. Old silver dimes and quarters. Also, have one pistol and one rifle for each “adult” family members with about 1,000 rounds of ammo per gun. It is best to have ALL weapons the same “caliber”, which in my family is the 9mm. All our weapons are 9mm. Glocks, Berettas, and even our “AR-15″s. All 9mm. Then have enough food, and a water source, for at least 6 months for each family member. Long enough for the urban centers to “clear”. This is America’s future and you have 6 months to prepare. I trust mine and have put all my money in the shares of one company. Invest in long- term certainty regardless of the ups and downs of the economy. Whose share price has risen more than 10% since April 2015. The company’s products are bought by public sector organisations whose own funding arrangements even in austerity are assured. The products are used for statutory compliance so unless there is a change in the law the company’s offerings will always continue to be needed. Tell us again about the “greatest bubble ever” in China and how the Russian economy is in the tank. I like to tie my industry in to these topics as much as possible with “on the ground” and ” in the trenches” type discussion. I’m in the industrial side of construction (non residential) and typically stay in the refrigeration, refinery, food processing plants etc. etc. My customers are in the Central Valley from Sacramento to Fresno and a small hand full in the Bay Area. There is definitely a slowdown this year. Plants are only doing projects they have to and aren’t rolling the dice on large capital projects. Not all, but most contractors and vendors are all saying the same. Just enough work to keep the doors open and run skeleton crews. I myself have paid cash for everything (even if it meant buying used equipment) and have no debt, but I can see the “panic button” starting to get hit by some of those who where not so frugal. Haha! Love it! Take THAT, central planners and data-followers…! I spent my morning doing some thrift store shopping. These places are busy. Their merchandise stocks in clothing are high, everything else is much lower than in the past. I stopped off at a furniture consignment shop and they actually have two store fronts in the same strip mall. It was busy as well, very middle class traffic. People don’t have the money to spend freely, the moms with kids were buying clothing, toys and books. From the look of the consignment shop, people are selling instead of donating their unwanted furniture. Having gone through the financial crisis in Florida, the furniture sales tell me there might be an increase in foreclosures in the area. Most of the furniture was oversized and would not fit in an apartment. Something tells me these people are not redecorating. Petunia: I remember reading that you had relocated to Texas. Are you in or near an oil center? I was wondering if some of the downsizing you observed in the furniture consignment stores was oil industry downturn related. One of my old geology school buddies lives in the Woodlands area and he just retired. I always thought they would have to haul him out with a tag on his toe. Brilliant geologist, very experienced oil finder and the ultimate company man. He must have believed the downturn is long term. Wolf – your optimism could be innate or something rubbed off from your well-off neighbors in Silicon Valley. Ask yourself this – when you immigrated from Germany, what was the US unemployment rate – how easy/difficult was it to get a job and earn the cash to pay for a decent life style. Fast forward to today – haven’t the cartels hurt you and me – try to start up a mom and pop insurance brokerage – a candy store – any small retail business. It is much more difficult and expensive. It is not the competition from the Internet – every mom and pop does internet business on the side or visa versa. It is the banking cartels; the insurance cartels; gasoline cartels; logistics cartels; etc. These cartels are not more efficient – they just make certain that no competitors start up. It is the fundamental refusal of government to break the cartels up that is killing this country. Take a look at your insurance premiums for the past 10 years – have they ever gone down – no. Have the risks gone up – not much. What choice do you have – call another broker – good luck. Great website. Sobering analysis from you and your readers.